The results of the 2016 UK & Isle of Man hen harrier survey has just been published in a paper in the journal Bird Study. The 2016 survey was the fifth since 1988/89 and was a partnership between RSPB, Scottish Natural Heritage, Natural Resource Wales, Natural England, the Scottish Raptor Study Group, the Northern Ireland Raptor Study Group, Northern England Raptor Forum and Manx BirdLife. Known for their majestic skydancing ritual, this graceful raptor is one of the most threatened birds of prey in the UK. Historically hen harriers were once a much more widespread breeding species before they were driven to extinction in mainland Britain during the 19th century. Despite its comeback, the species has remained rare in the UK with a breeding population under 1000 pairs making it vulnerable to the effects of habitat loss, weather and illegal killing. Complete surveys were made of all 10-km squares likely to be occupied by breeding Hen Harriers in England, Wales, Northern Ireland, Isle of Man and Orkney. 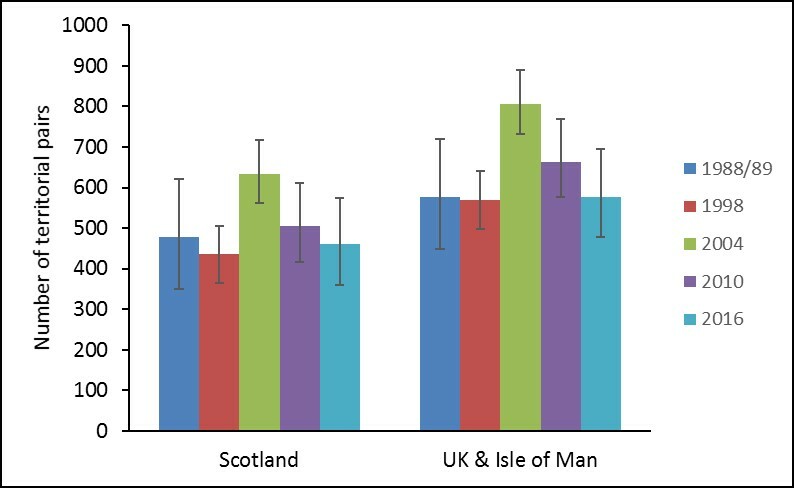 For the rest of Scotland, self-selected 10-km squares were surveyed by volunteers and a stratified random selection of the remaining 10-km squares within the known breeding range were surveyed. Surveys were carried out from the end of March to the end of July, in suitable weather conditions, a challenge given the summer we had! A minimum of two visits were made to each 10-km square. If breeding was not confirmed during the two visits, a third visit was recommended between late June and the end of July. The fieldwork was carried out by members of Raptor Study Groups and Upland Bird Study Groups, other volunteers, staff from the statutory agencies, RSPB and other conservation bodies and RSPB contract Conservation Science fieldworkers. 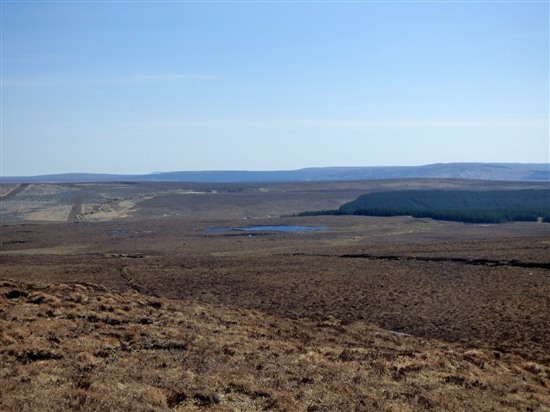 Suitable habitat for breeding Hen Harriers in the UK and Isle of Man is typically moorland, both heather and grass dominated, and upland young forest and we surveyed all such habitat within each 10-km square. Also, observers were alerted to the possibility of birds nesting within closed mature coniferous forest, and to consider such areas as suitable habitat. Surveys were conducted through a combination of searches and scanning suitable habitat from appropriate vantage points. One of my vantage points on the edge of Forsinard RSPB nature reserve in the Flow Country. Taking part in the survey involves a high level of dedication as each 10-km square could take three to four days to complete one visit if it contained a lot of potentially suitable habitat, particularly in some of the more remote areas in Scotland. I took part in fieldwork myself, on Orkney, in the Flow Country and in mid Wales. It was fantastic to be able to spend some time surveying, and finding Hen Harriers, on Orkney, where there are the highest densities of breeding harriers in the UK, and in the remote wilderness of the Flow Country. I was not so lucky in my survey squares Wales where I did not see any harriers during my survey visits. UK-wide: The population estimate for the UK and Isle of Man in 2016 was 575 territorial pairs, a non-significant decline of 13% since the last full survey in 2010, but a significant decline of 24% since 2004, the year of the highest population estimate. Scotland: In Scotland, the 2016 population estimate was 460 territorial pairs c80% of the UK population), a non-significant decline of 9% since 2010, but a significant decline of 27% since 2004. Orkney (83 in 2016) and the Hebrides (49 in 2016) were the only Scottish regions to report small increases. There were declines elsewhere in Scotland, particularly in East and Southern Scotland. 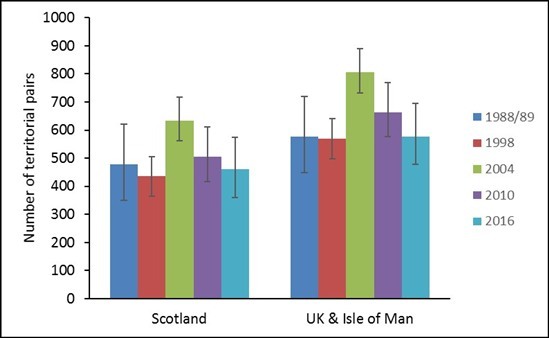 As in previous surveys, the West Highlands held the largest proportion of the Scottish population (40%), at an estimated 175 territorial pairs (compared to 234 at the peak in 2004. Wales: Numbers have fallen in Wales, from 57 territorial pairs in 2010 to 35 in 2016, and Northern Ireland also experienced a decline since 2010, from 59 to 46 breeding pairs. England: Only four breeding or territorial pairs were found in England, down from 12 in 2010. On the Isle of Man, numbers remained stable since 2010, at 30 pairs, although substantially down on the 57 pairs recorded in 2004. 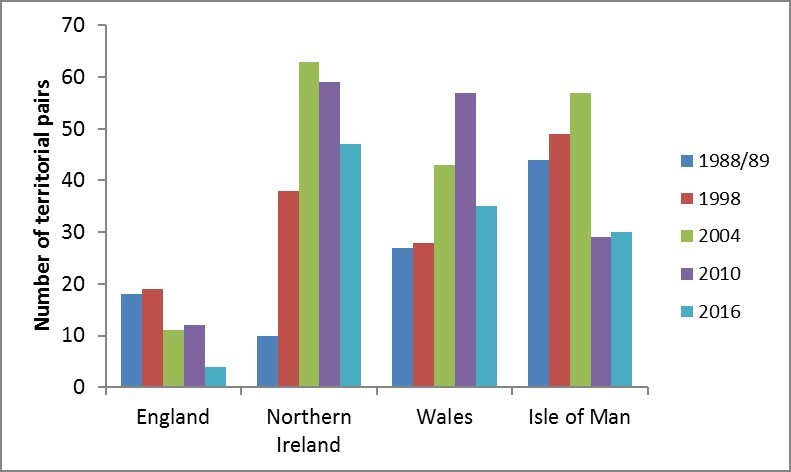 The trends in numbers of territorial pairs between 1988/89 and 2016, in (a) Scotland and the UK & Isle of Man, and (b) England, Northern Ireland, Wales and the Isle of Man. From previous independent research, it is known that the main factor limiting the UK hen harrier population is illegal killing of these birds associated with driven grouse moor management in northern England and parts of mainland Scotland. Other pressures such as cold and wet weather conditions over a number of breeding seasons, changes in habitat management and low prey abundance could have all had an impact on numbers throughout the UK. You can read the full paper online. The survey would not have been possible without the dedication of the members of the raptor and upland bird study groups across the UK as well as volunteers and staff from RSPB and the statutory authorities. Thanks go to all the Scottish Raptor Study Group, the Northern England Raptor Forum, the Northern Ireland Raptor Study Group and all other raptor and upland bird study groups in England and Wales who helped to organise and took part in the survey, and to the RSPB fieldworkers. Thanks go to landowners and estate managers for access arrangements. Thanks to SNH, RSPB, NRW, Northern Ireland Environment Agency and the Isle of Man Department of Environment, Food and Agriculture for funding the survey. Ah. O.K. £35 for 24 hour access. I'd like to read it but not that much. Thanks anyway. I would be interested in reading the full paper about this continuing important work but the link does not seem to work.